Gout de terroir. Wine aficionados are familiar with this phrase, which refers to the “taste of the soil” that gives great wines their characteristic flavor and aroma. It’s not a word you hear much outside of the famous wine growing regions of France, and perhaps California’s Napa Valley. 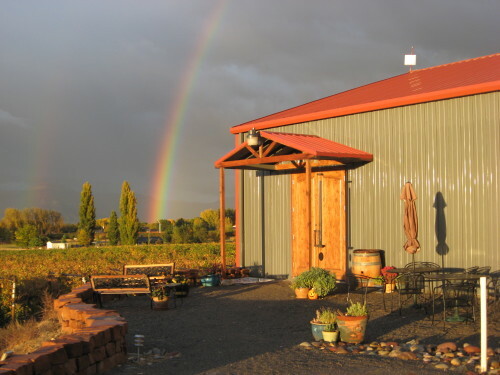 But since 2004 you’ll probably hear about gout de terroir in at least one other place: the chilly, high-altitude vineyards of the prize-winning Whitewater Hill Winery–situated quite happily at 4600 feet in Grand Junction, Colorado. It’s not a region where you’d expect to find a serious oenological installation. But Nancy Janes and John Behrs, the owner-operators of Whitewater, don’t see why that should stop them from achieving their dream of making great, hand-crafted wines. In spite of bone-chilling winters, and the occasional loss of 80 percent of their crop, Janes and Behrs have made Whitewater into something of a tourist attraction as well as a serious vineyard. 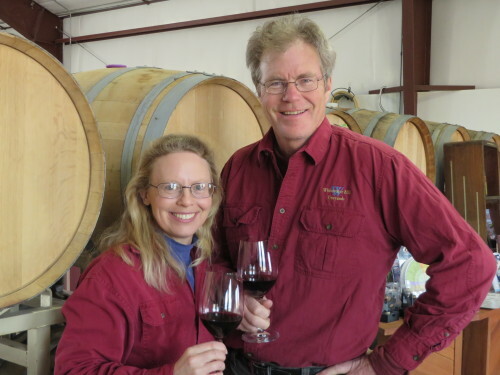 Janes and Behrs (who are married) founded Whitewater as a vineyard in 1998. They decided to become a winery as well in 2004—which means they’re celebrating their tenth anniversary this year. Like most small business people they wear many hats. Janes is the winemaker and takes care of running the tasting room. She also manages landscaping, driving, and sales. John is the vineyard manager and does all the outdoor work, equipment repair, and tech support. Tech support is the easiest part. Janes and Behrs were both computer people before they reinvented themselves as vintners. John was an electrical engineer; Nancy was a software engineer. And according to Janes, winemaking was a hobby that got out of control. Isn’t it quite a change from the world of high-tech? What in the world led Janes and Behrs to start a vineyard in an inhospitable locale like high-country Colorado? But once Janes and Behrs get the grapes through the winter there’s enough heat, and a long enough growing season to make lovely wines—wines that have done extremely well in international competitions. Janes and Behrs started their website in 2004—but it’s still less sales-oriented than they’d like. In addition, Janes sells the wine wholesale where she can, driving between Grand Junction, Denver, Fort Collins, and Colorado Springs with a car full of wine bottles. She gets an appointment to visit a shop, lets them taste the wines, and hopes they might be interested in carrying them. Even so, about 70 percent of Whitewater’s sales are tasting room sales. Whitewater’s competition record really is quite impressive. Janes won a double gold medal for her dessert wine at the Finger Lakes Wine Competition—a serious, international contest. Last year she took home the Commissioner’s Cup for Best Wine in the Valley for her Reserve Red Blend. And her 2012 Ethereal has recently gone Gold at both the Indy International Wine Competition and The Jefferson Cup. Janes’ and Behrs’ high-end spreadsheets helped get Whitewater past many of the usual start-up challenges. “You want to spend your time with your customers,” she laughs, “and making your wine, and you don’t anticipate how much paperwork is involved. Taxes and forms and licenses and all that stuff. Being software folks, we set up some reports coming out of the computer database that helped us a lot.